Please support our advertisements at Death.FM. If you click here first to purchase an item from one of our sponsors then we get a small commission. Amazon.com - Before purchasing anything from Amazon.com, please do so via the links here at Death.FM. We get a small commission from anything you purchase. We accept Amazon.com's payment in gift certificates, so each quarter we use that in return to purchase new music. Spread the word! Tell everyone you know about Death.FM! Recommend Us - Email your friends about Death.FM! 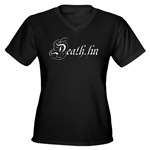 Death.FM Shop - Purchase Death.FM merchandise!